Birch Bay State Park is a 194-acre camping park with 8,255 feet of saltwater Shoreline on Birch Bay and 14,923 feet of freshwater shoreline on Terrell Creek. The park is rich in shellfish resources and offers panoramic views of the Cascade Mountains and Canadian Gulf Islands.Birch Bay and along Terrell Creek allows camping, picnicking, fishing. Here's the our members favorite photos of "State Parks in Washington". 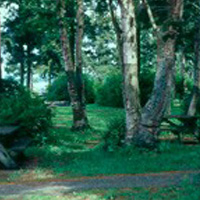 Upload your photo of Birch Bay State Park!